The University of Illinois Springfield Society for Human Resource Management (SHRM) chapter recently finished second out of eight teams in the Illinois SHRM Student Conference Human Resources (HR) Case Competition held at Illinois State University in Normal March 29-30, 2019. UIS students competed against students from other Illinois colleges and universities during the annual event. The second place HR Case Competition team was made up of undergraduate students Alexis Eddings of Jacksonville (team captain), Tracy Cessna of Pana and Marina Gendek of Lake Bluff. The team also included graduate students Cuong Nguyen of Ho Chi Minh City, Vietnam; and Trinh Tran and Le Tran of Springfield. 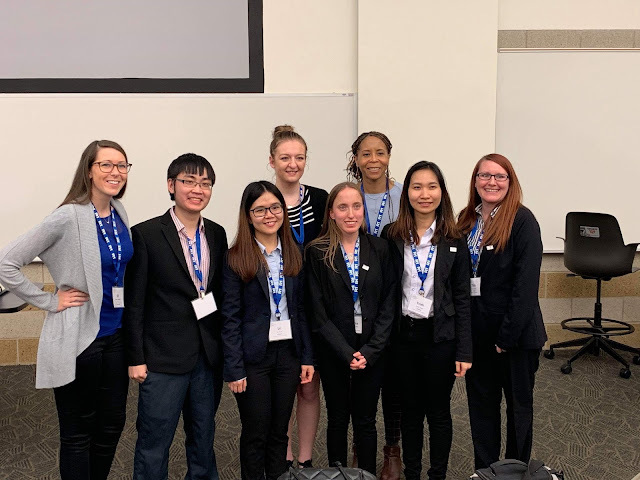 UIS students also competed in the HR Jeopardy Games where they were placed into 18 random teams with students from other universities. Eddings finished on the second place HR Jeopardy team. Students say they benefited from the conference because they learned valuable information about their future career field. “We were able to network with popular and reputable HR professionals, listen to speakers discuss current issues and change in HR regarding disabilities, women's empowerment, veterans, and other organizational change, and connect with peers like us who are going into HR, which is helpful because we will most likely meet again in the workforce,” said Eddings. The SHRM chapter at UIS is advised by UIS Management Instructor Donna Rogers Skowronski.